Industry standard 3/8" webbing connectors. Genuine Canon neck strap. Manufacturer: Canon. Canon part number: EW-400D. We always found the Rolleiflex Scissor strap a excellent strap - but the problem is they are getting too old, and are breaking. To have a expensive Rolleiflex around your neck with a brittle leather strap is not a good idea. Double Dual Shoulder Strap Belt Holster Fujifilm X100T FinePix S9900W XQ2 X E2. Lensmate LM X20 for Fuji X20 Thumbgrip . Condition is New in box. Dispatched with Royal Mail 1st Class. 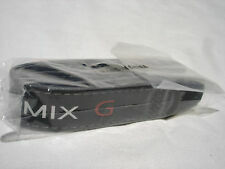 Still on sale in the UK for over ,6 no Also see my other items for the X20 for sale. Part number: ACAM E25 BLK. Premium quality quick adjust sling strap made by Artisan and Artist, Japan. Can be used as a neck strap, shoulder strap or a sling. Award winning "Easy Slider" design. MODEL: XTGPFH. WHATS INCLUDED: HANDLE. WE WILL WORK TO RESOLVE ANY ISSUES YOU HAVE. 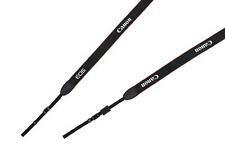 GENUINE CANON 5D MARK III NECK STRAP. This is the last batch we have available. Get Social. Fujifilm X-PRO2. Well-designed, the battery is accessible with the grip attached. flash diffusers. Or if the product was sent to you in error by our staff. Product View. other assessorices. Just give us the opportunity to resolve a problem. Both the bottom and top of strap are easily adjusted to the size of your hand. While it provides added support, the use of the snap-on wrist strap is a matter of personal preference. In addition, with repeated use, the leather will conform to the unique shape of your hand for a custom-like fit. Hand made camera strap made from Green real leather hexagon pieces sewn onto some green nylon webbing. There are leather hexagons on both sides of strap. Each strap may vary in shade of green leather hexagons. The total length is approx 39 inches . The hexagons are 2" wide. The webbing is 1" wide. The strap has metal rings and hooks on them. Material : Leather. Black Colour. Color : Black. You Are Looking At. NOT SUITABLE FOR LARGE HANDS. A really high quality item (although not official Rolleiflex - it is equal to original). Dark Brown. Made of genuine leather. Quick release mounting plate. Otherwise it will delay the response. Light, soft, wide, anti-slip. If anything is wrong, defective, missing part, etc. Skout Binoculars Sling Style Harness. The harness features a small zip pocket, quick release tether for extra protection, and a slip-over weather cover. The complete warranty is included with the product. Full grain leather. A soft and supple leather, 3/8" wide. Footprint wrist strap hand made in the UK with finest Italian. TAN DAKOTA/BLACK LOOP. Fitted with a dyneema loop. Ideal for the Ricoh GR. Flickr pages. This is the 100cm version. Orange/Black (10mm Orange braided marine rope with black leather ends). Black stitching. The Breathe Hybrid is loaded with BlackRapid’s pro series features, including spring-loaded stability locks, a Duraflex buckle, and a Lockstar carabiner cover. The strap includes two FastenRs (FR-5), ConnectRs (CR-3), and Lock Star carabiner covers. The Breathe Sport is loaded with BlackRapid’s pro series features, including spring-loaded stability locks, Duraflex buckles, and a Lockstar carabiner cover. The strap includes a FastenR (FR-5), ConnectR (CR-3) and a Lock Star carabiner cover. They’re stylish, strong, and flexible. This strap is about 42", This is the standard length. Black/Black (10mm braided marine rope with black leather ends). Strap is about 115cm long and 12mm wide. 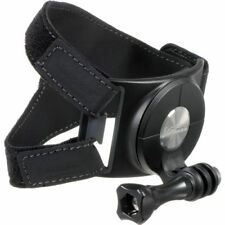 The neoprene wrist strap is adjusted around the wrist with a security slide to keep it firmly in place. Neoprene strap secures comfortably around the wrist. Materials Neoprene pad, nylon webbing and leather tab. We are not responsible if you are order wrong item. William Eggleston. EGGLESTON. my most popular strap - supple and minimalist in design. RODCHENKO. essentially this an EGGLESTON but with a 32mm wide shoulder pad to help spread the load. Available in REGULAR 115cm, CUSTOM and BUCKLE ADJUSTABLE lengths. SONY A6500. Well-designed, the battery is accessible with the grip attached. Or if the product was sent to you in error by our staff. Product View. other assessorices. Just give us the opportunity to resolve a problem. Strap length: Approx. -Strap width: Approx. Each strap costs £3.99. Type: Float belt. Model Number: Y1301. Hasselblad leather carry strap for 500cm, 501cm, 503cw, 503cx etc. "Hasselblad" stamped on leather. A really high quality item (although not official Hasselblad - it is equal to original). Genuine leather - based on the original design. We have this strap available with White or Yellow letters. One (1) Third Party Neck strap for nikon. for Nikon?. on the logo. long eyelet strap. Soft, padded inside. The Foto&Tech 11" Padded Neck and Shoulder strap features a double-sided black neoprene fabric pad. Soft and gentle, it gives a very cushioning feeling. 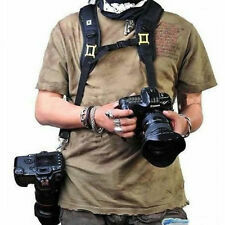 Distributes overall weight of DSLR evenly across your shoulders. Look fab with your strap. Strap length: 67cm / 26.4in. Strap width: 3.7cm / 1.5in. Made of cotton fabric and PU leather, durable and comfortable. Material: cotton fabric and PU leather. Color: 01, 02, 03, 04, 05, 06, 07(optional). Black leather / neoprene. FAMILY RUN SINCE 1954. The leather I have used is top grade leather with extra grain.